This post veers a little to the left away from homebuilding towards a commercial retailer but that’s alright with me. Why? Because it has to do with solar energy being harnessed by Mellow Mushroom Pizza Bakers in Knoxville and any homeowner with a south-southwest roof line that’s clear of trees can harness the sun’s rays, too. I was reading Lynnette’s pizza post over on sister site The Fun Times Guide To Franklin/Nashville (TN). 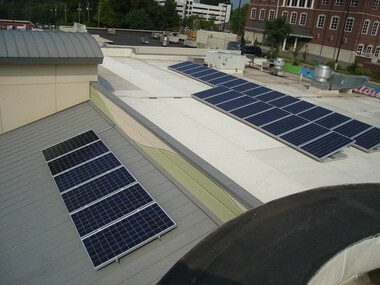 On a whim I spent a few minutes looking into the Mellow Mushroom (ultra-cool) corporate website and discovered that the Knoxville location recently installed a solar panel array on its’ roof. To me, that says a lot about where their head is at. Why aren’t more retailers installing solar panels on their roofs??? Wal-Mart has a humongous solar plan in the works…but that is another story altogether. This post is about a semi-small franchise going above and beyond to go green. I, too, am a fan of Mellow Mushroom pizza (I like the house special) and have been a fan for many years. I first experienced the awesome goodness of Mellow Mushroom pizza at the Howell Mill Rd. location in Atlanta about 15 years ago and most recently in Hiram, GA. It’s as good as I remember, although the Hiram location definitely does not have that unmistakable ‘hippie chic’ atmosphere that the Howell Mill location possessed…but the pizza still tastes great. Anyway, I was very impressed to learn that the Mellow Mushroom on Cumberland in Knoxville took a leadership role for all of the surrounding retailers…with a roof…by having solar panels installed. They’ve even got a website showing real time solar power generation with historical power generation info in the hyperlinks. Apparently, it’s been three years in the works and has been up and running for just a short time. Hopefully, more retailers will ‘think globally and act locally’.